Winter has finally come and gone, leaving the wonderful, albeit rainy, spring season in its wake! There’s plenty to do now that things have finally warmed up, and taking care of your car is one of them. Dirt, grime, and salt can build up over winter and, if left untreated, could result in rust of paint damage. Don’t take a hit on your car’s trade-in value! Take these spring car care tips from us here at Wantagh Mazda! 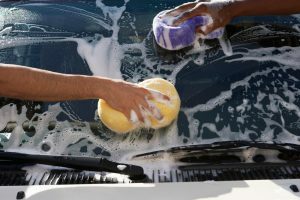 Wash and Wax – Whether you’re on your way home from work or parked in the driveway, the first thing your car needs is a good wash. By washing your car thoroughly, you eliminate most of the salt, dirt, and grime that built up over winter. A quick wax doesn’t hurt either! Tires – Now that winter’s over, this is the perfect time to take care of your tires. Check the tread depth and air pressure. If you added air to compensate for the colder weather, make sure your tires aren’t overinflated now that things have warmed up! If they are, let some air out. Inspection – Checking your car’s belts, hoses, and engine can likely be done at home, but if you want to be safe, have your local dealership perform a full inspection. They’ll make sure everything is in tip-top shape and ensure that you’re good to go until next year!